Deluxe Bath Bench Assembled with easy to install, tool free assembly of back support. Blow molded bench and back. Lightweight aluminum frame. Angled legs provide additional stability. Limited Lifetime Warranty. 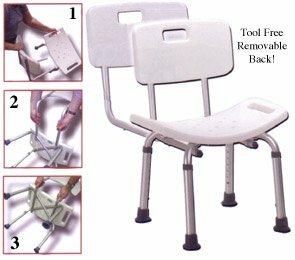 Assembled with easy to install, tool free assembly of back support. Blow molded bench and back. Angled legs provide additional stability.